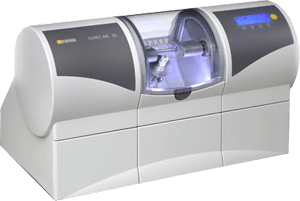 CEREC (Chairside Economical Restoration of Esthetic Ceramics, or CEramic REConstruction) is a product that allows a dental practitioner to produce an indirect dental restoration(created outside of the oral cavity) using a variety of computer assisted technologies, including 3D photography and CAD/CAM. With CEREC, teeth can be restored in a single sitting with the patient, rather than the multiple sittings required with earlier techniques. Additionally, with the latest software and hardware updates, crowns, veneers, onlays and inlays can be prepared, using different types of ceramic material. The treating dentist prepares the tooth being restored either as a crown, inlay, onlay or veneer. The tooth is then powder sprayed with a thin layer of blue anti-reflective contrast medium, imaged by an intra-oral 3Dimaging camera and uploaded to the CEREC computer. 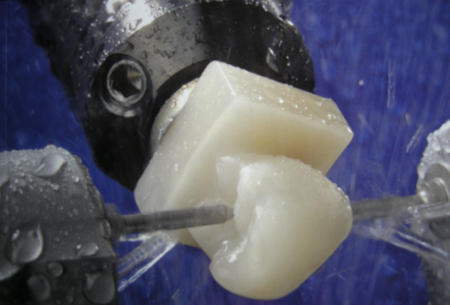 Using the proprietary 3D Computer Aided Drafting (CAD) CEREC software , a restoration can be designed to restore the tooth to its appropriate form and function. When the design phase is complete the data on this restoration is stored in a file and is sent to the milling machine. The restoration can then be milled out of a solid ceramic or composite block. Milling time varies from as little as four minutes to as long as twenty depending on the complexity of the restoration and the version of the milling unit. The immediate restoration is bonded to the tooth using a resin cement which bonds to both the restoration as well as the tooth itself.